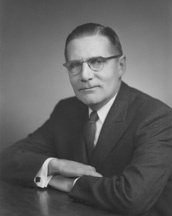 PROUTY, Winston Lewis, a Representative and a Senator from Vermont; born in Newport, Orleans County, Vt., September 1, 1906; attended public schools, Bordentown (N.J.) Military Institute, and Lafayette College, Easton, Pa.; mayor of Newport 1938-1941; member, State house of representatives 1941, 1945, 1947, serving as speaker in 1947; chairman of Vermont State Water Conservation Board 1948-1950; officer and director of family-owned lumber and building material enterprises; elected as a Republican to the Eighty-second Congress; reelected to the three succeeding Congresses (January 3, 1951-January 3, 1959); was not a candidate for renomination in 1958; elected to the United States Senate in 1958; reelected in 1964 and 1970 and served from January 3, 1959, until his death; died in Boston, Mass., on September 10, 1971; interment in Pine Grove Cemetery, Newport, Vt.
American National Biography; U.S. Congress. Memorial Services. 92nd Cong., 1st sess., 1971. Washington, D.C.: Government Printing Office, 1972.